Dave Bautista, one of the stars of 'Guardians of the Galaxy Vol. 2,' opens up about stealing cars, building self-confidence in the gym, chasing wrestling dreams, and gunning for actor street cred. He was gangly. No, really, the guy you see on these pages—the man who now plays the hulking, lovable character Drax in Guardians of the Galaxy Vol. 2, hitting theaters May 5—was a gangly teen. Tall and skinny. Lanky. Shy. Supershy. Awkward. Painfully awkward. Didn’t feel like he fit in. Almost ever. But the one place he wasn’t awkward, the one place where he always fit in, was the gym. It was his safe haven, his sanctuary, his nest. 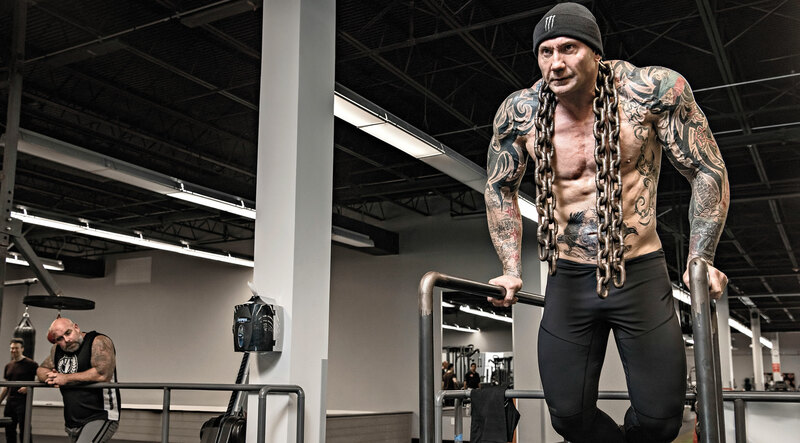 Growing up in the D.C. area in the ’80s, Dave Bautista always felt at home in the weight room. Like he belonged. “I was a gym rat,” says Bautista.